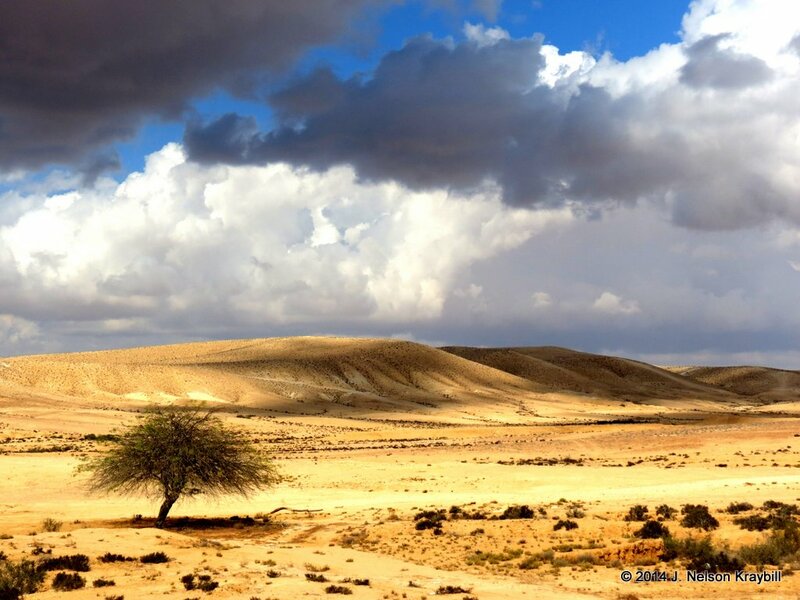 At “a day’s journey into the wilderness” south of Beersheba, a lone broom tree stands in the area where an angel awakened Elijah. What drama and trauma occur on Mt Carmel! Elijah takes on the combined spiritual forces of four hundred and fifty prophets of Baal and four hundred prophets of Asherah (1 Kings 18). The object? Call down fire from heaven on competing altars to demonstrate who is God. “How long will you go limping with two different opinions?” Elijah demands of Israelite spectators. “If Yahweh is God, follow him; but if Baal, then follow him.” Canaanite prophets call to their god in vain, and Elijah ridicules: “Maybe your god is meditating . . . or on a journey, or asleep!” Perhaps Baal has “wandered away,” a Hebrew euphemism for relieving himself! The contest is deadly serious. Queen Jezebel has slaughtered prophets of Yahweh, and Elijah will be next if he fails to deliver. But fire descends when Elijah prays. It consumes not only the sacrifice, but even stones underneath. In the bloody theater of ancient Canaanite culture, what follows is not surprising. “Seize the prophets of Baal,” Elijah cries. “Do not let one of them escape.” The losers face summary execution at a gully (wadi) in Jezreel Valley below Mt Carmel. At Muhraka on Mt Carmel this statue of a vengeful prophet Elijah stands at a possible site of his confrontation with prophets of Baal. The story of Elijah’s angel in the desert comforts me when the journey seems too much. I know what it is to be exhausted and depressed; angels of God have sustained me. I too want bread of heaven to feed me for a long journey to the “mount of God” (1 Kings 19:8). 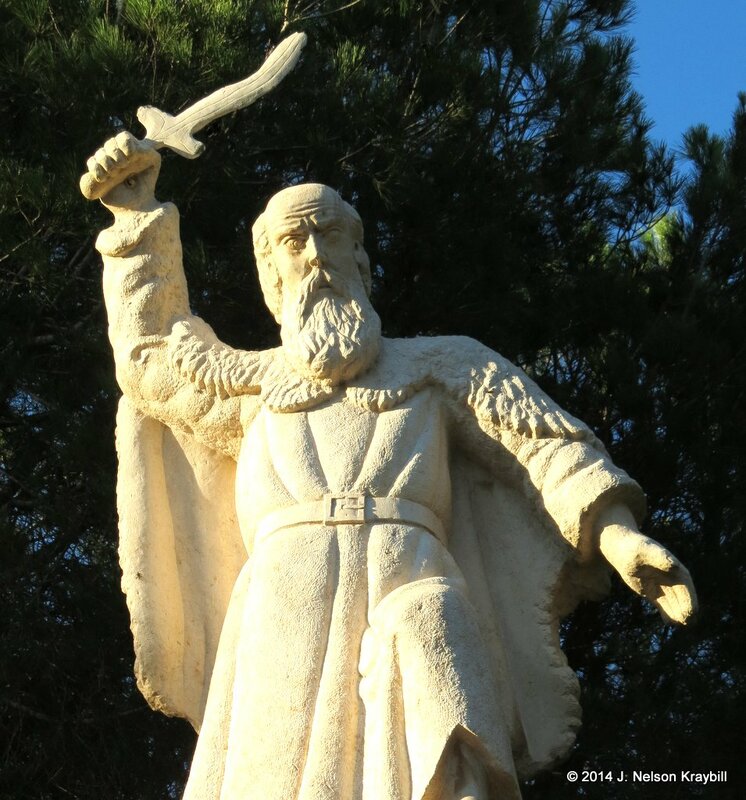 I admire Elijah’s courage at Mt Carmel, but am unsettled by his slaughter of adversaries. Elijah later appears with Moses on the mountain of Transfiguration, talking with Jesus (Matthew 17:1-8). What did Jesus, who rejected violence, say to the fiery prophet? When Jesus said “love your enemies,” I believe he meant to include even persons of other religions who might seek to do us harm. This entry was posted in Uncategorized and tagged Baal, Conflict, Elijah, Mt Carmel, PTSD by nelsonkraybill. Bookmark the permalink.